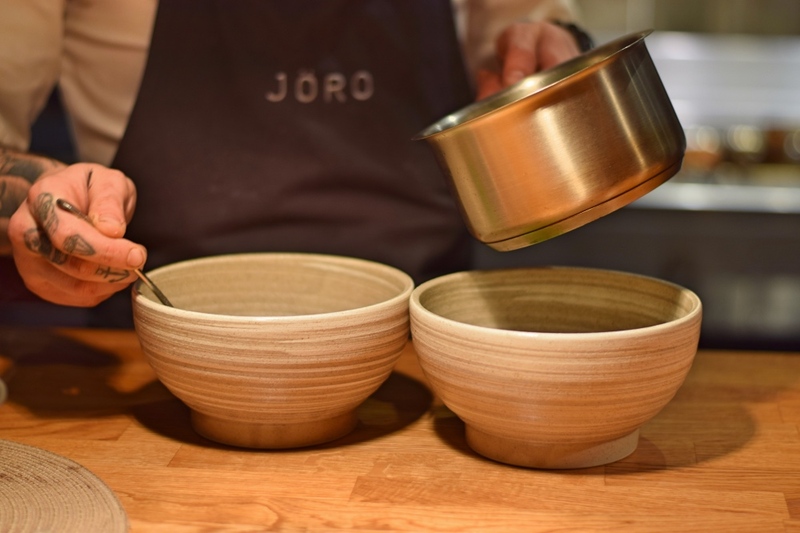 This week we had the pleasure of attending the newly opened Jöro (pronounced Yoro), based in Kelham Island Sheffield. 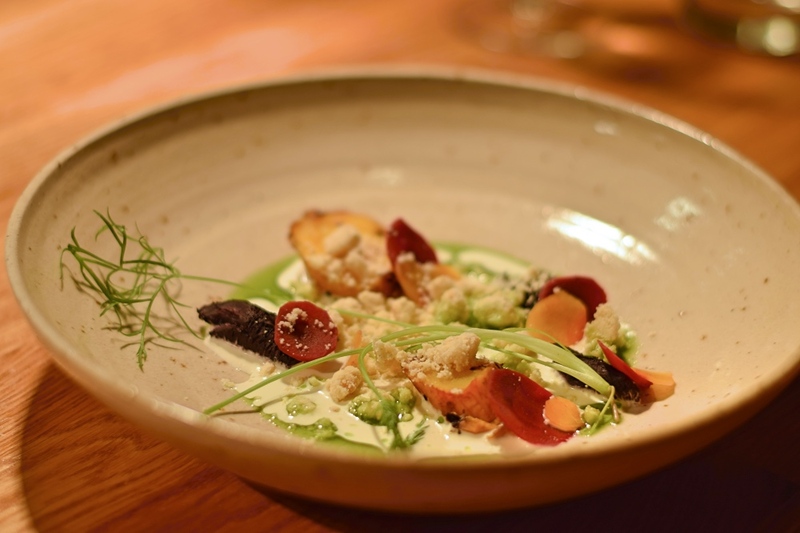 For those of you that haven’t witnessed their incredible Instagram images or been living under a rock recently, they’ve pretty much turned the Sheffield restaurant scene on its head. 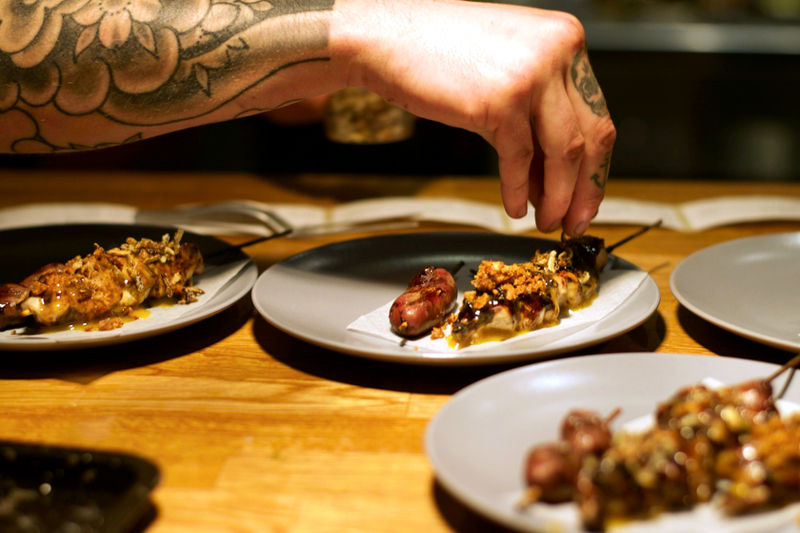 Back in October we went to one of their pop up events hosted at The Milestone and we, as well as every other guest were absolutely blown away by the food, the concept, the attention to detail and the staff’s interaction to create a whole new dining experience. Now at their new home KRYNKL – a revolutionary new space created to showcase exciting independent businesses – made entirely out of reclaimed shipping containers, couldn’t be a more fitting home for this forward thinking restaurant, that celebrates the best local ingredients in their ever changing ‘hyper seasonal’ menu. 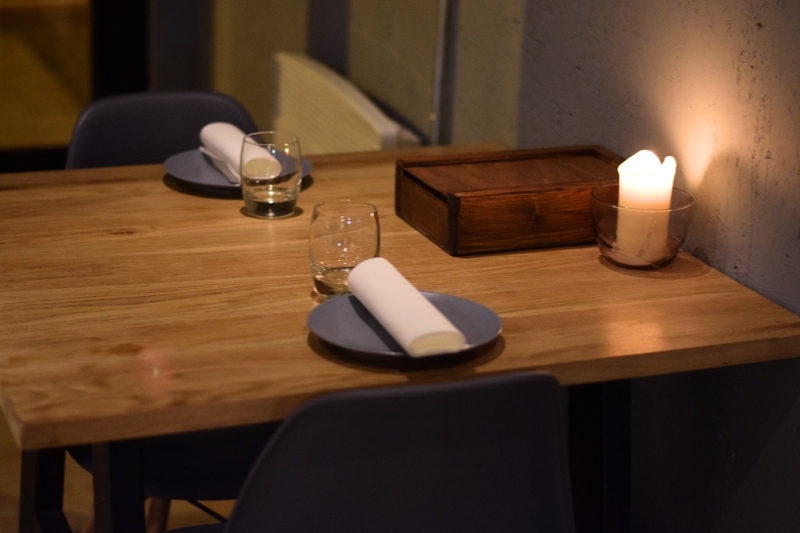 The restaurant itself is a stripped back minimal affair, relaxing and atmospheric with soft lighting, candlelit tables, chilled hip hop beats and local artists adorning the walls. We were lucky enough to sit at the ‘Chef’s Table’ where up to four diners can enjoy the experience of watching Head Chef and Co-Owner Luke French and his team create the dishes and interact to discuss the dishes, ingredients and also the many high tech kitchen gadgets used to create such amazing flavours. Their concept is ‘a meal made of many small plates’, allowing you to have as little or as much as you want, snacking as you go. 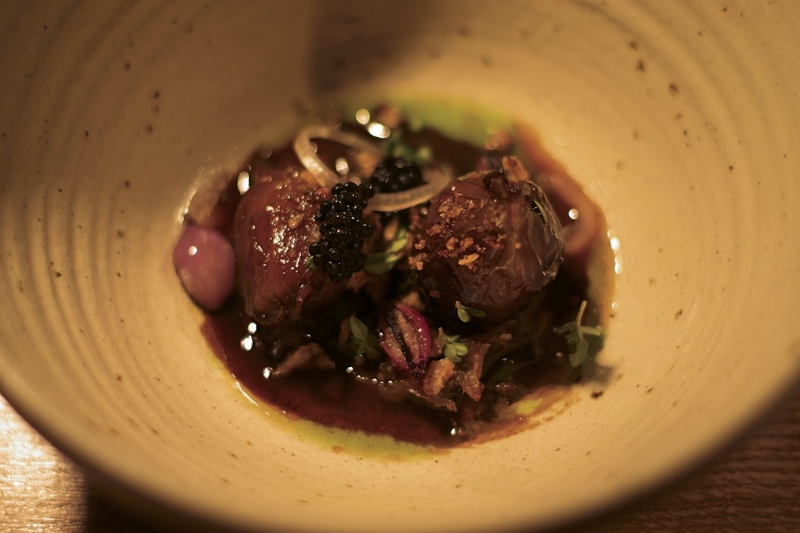 You can choose the dishes that take your fancy or go for their 8 or 12 course tasting menus. Being greedy and keen to experience their new dishes we went for the 12 courses! Special care and attention has also gone into Jöro’s wine selection, all are organic and biodynamic. Going on the recommendation of Bryn their in-house sommelier, we tried two deliciously light and crisp white wines, my favourite being the White Rioja. 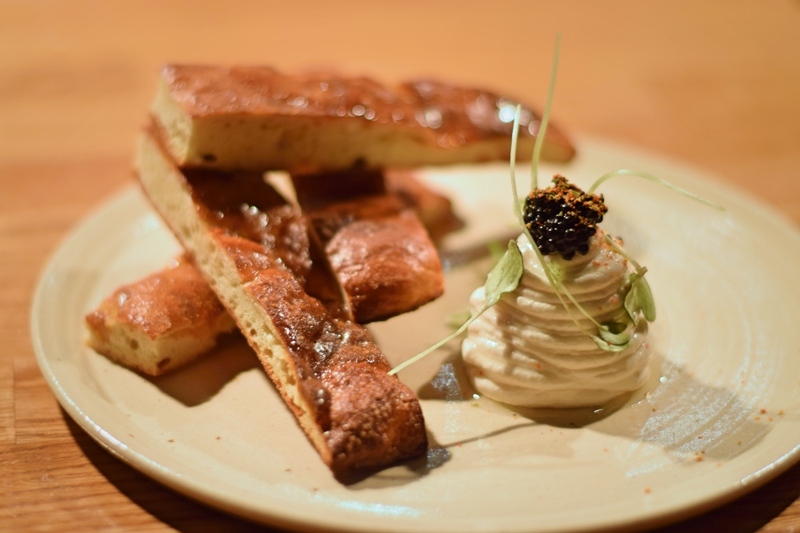 We started the evening with homemade ‘Turkish pide flatbread, with taramasalata and smoked herring roe’, the taramasalata was delicious with the interesting addition of smoked coal oil from their in-house egg BBQ. Next, ‘Deep fried artichoke leaves filled with an artichoke puree, hazelnut mayo and hazelnut crumb’ and also ‘Homemade treacle bread’. 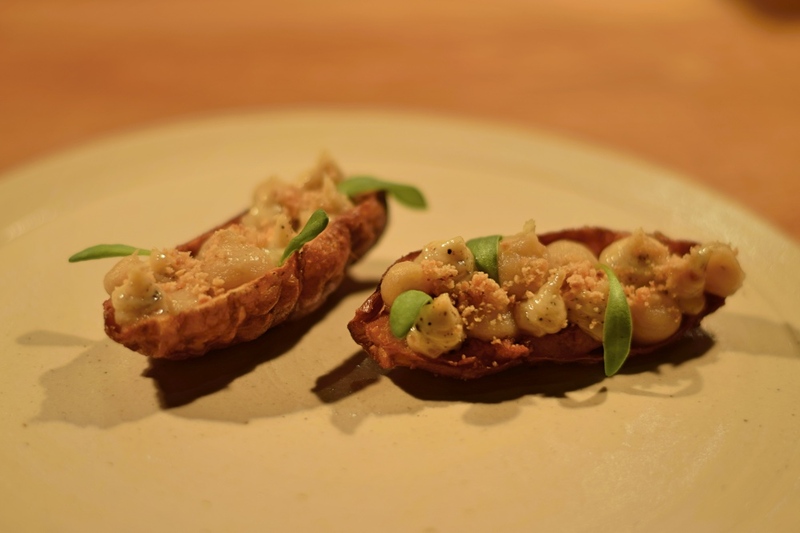 The artichoke leaves were unbelievable, a new creation from the chefs that day, crispy and slightly chewy with a real depth of flavour from the puree and hazelnut mayo. I really hope these are on the menu for our next visit! Only three plates down and already loving the Joro experience, the relaxed atmosphere and insight into chefs Luke and Blake Cooper preparing, presenting and explaining each creation. So much passion, love and creativity towards their seasonal ingredients. The next few dishes shortly followed on, ‘BBQ beetroot tatare garnished with linseed cracker, candied walnuts and micro herb salad’, this dish looked too good to eat and the smell from the BBQ in the kitchen emphasised the taste. 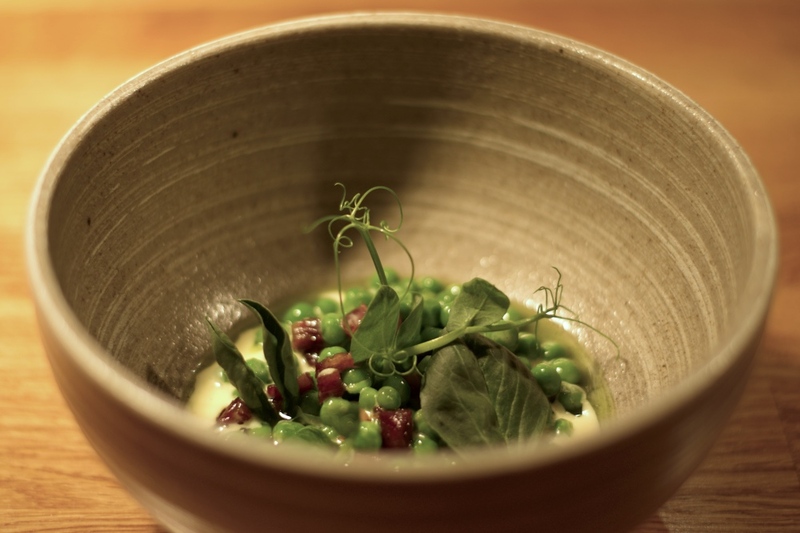 The most amazing bowl of ‘Peas cooked in tarragon oil’ followed next, with oak smoked pancetta and garlic cream. 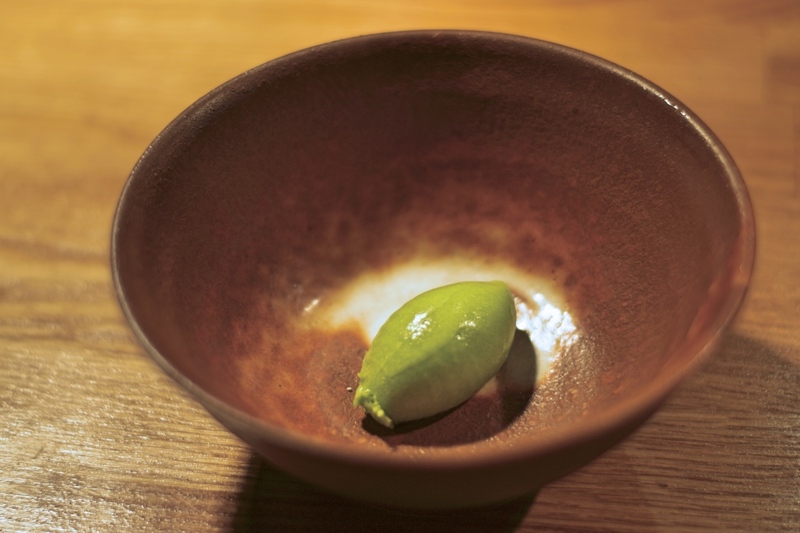 Then a palette cleanser of ‘Pea and mint sorbet’ which worked well after the smoky flavours and richness of the garlic cream. 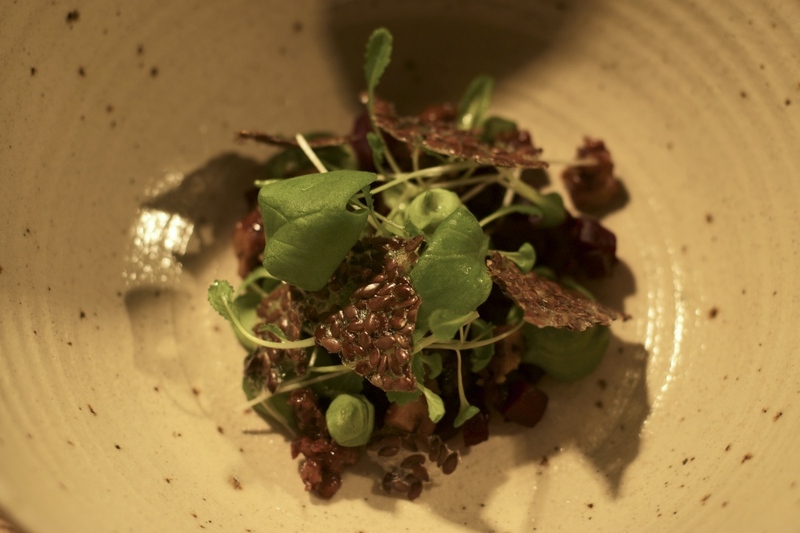 Each dish leaves you wanting more, perfect sizes for a taster menu. One of my favourite dishes of the evening, was their glazed onions served with herring roe, lemon thyme, pickled baby onion and crispy chicken skin. Really deep dark savoury flavours from the slow cooking of the onions and the herring roe, with an addition of the lemon thyme to lift the dish. A few Japanese inspired dishes up next. 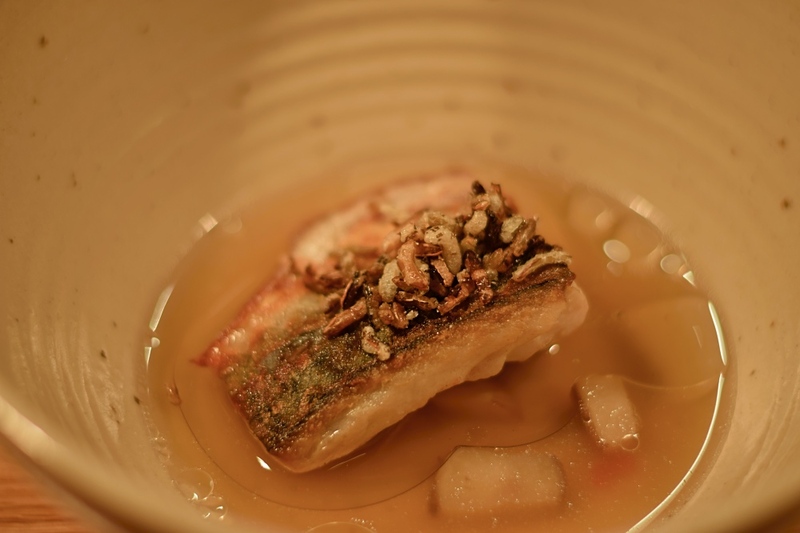 ‘Fillet of Mackerel’ served with pickled artichoke, puffed wild rice in a deep smoky broth made from smoked mackerel bones, then finished with miso oil. Another great dish with big bold flavours all complimenting each other well. 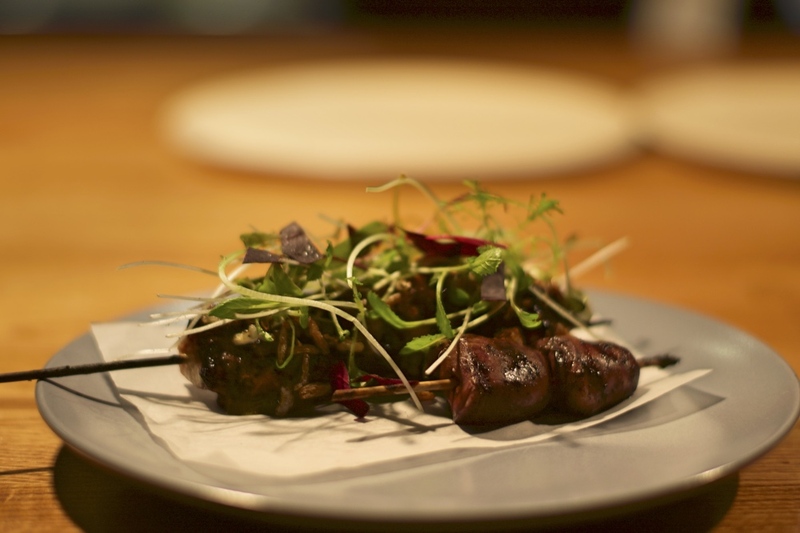 The ‘Yakitori’ chicken skewers went down a treat too, marinated with mirin, miso and soy then cooked in the barbeque and finished with miso cured egg yolk and micro leaves. Another star dish of the evening, ‘Barbequed heritage carrots’ served with a smoked barbeque cream, pickled carrot and tarragon oil then finished with a yoghurt and white chocolate crumb. The cooking techniques really brought out the natural sweetness from the carrots. So many different tastes and textures on one plate but all combining brilliantly. 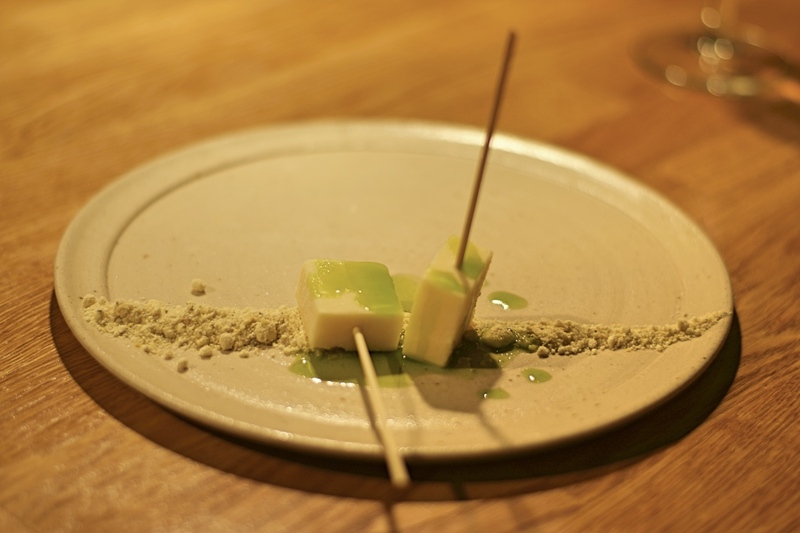 Onto the dessert courses next, sharp chewy ‘Seville orange ice cream’ served on a stick with a dash of tarragon oil and yoghurt and fennel sorbet. On paper I’m guessing you think this doesn’t work but trust me it was immense. 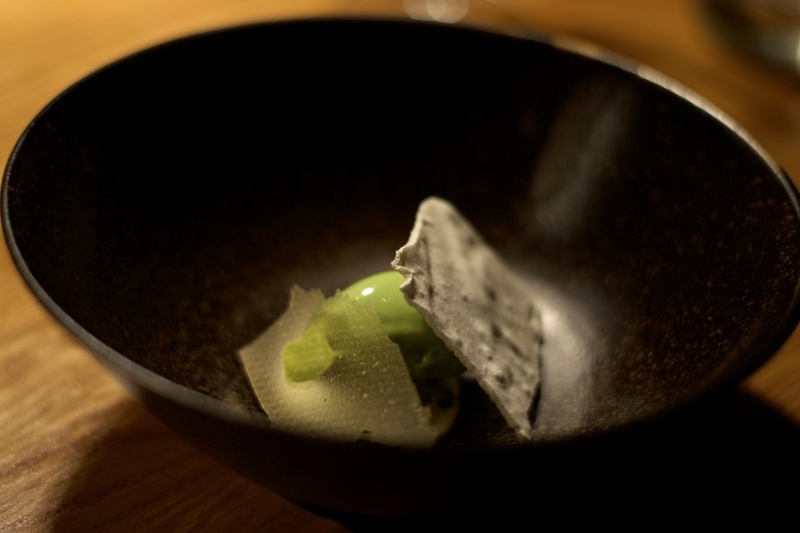 Our next dish, ‘Sorrel ice cream’ served with dill oil, granny smith apple and lemon verbena meringue, all served on a base of cream. Beautifully presented with clean and fresh flavours. 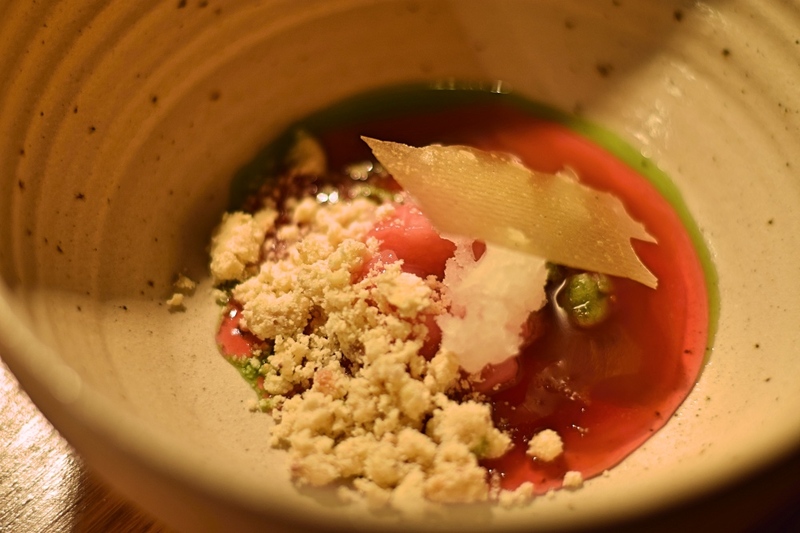 Our last dish of the evening and an incredible finale, local award winning Tomlinsons rhubarb compote served with an elderflower granita and a yoghurt crumb to give another taste and texture. Sometimes rhubarb can be a bit too sharp for my liking but this was perfectly balanced with acidity and sweetness. Another little extra Luke and the team create to go with coffee is the after dinner biscuits made from coffee grinds, topped off with a white chocolate ganache and beetroot powder – absolutely delicious. Once again Joro, Luke and his team delivered such a wonderful and unique experience, only using local and seasonal produce to determine the menu which changes daily. Each member of staff lives and breathes the ethos; when the warmer months reappear don’t be surprised to find the team foraging for ingredients to be served that evening in the restaurant. Good luck getting a table – when word gets out this urban restaurant will have guests queuing out of the door. 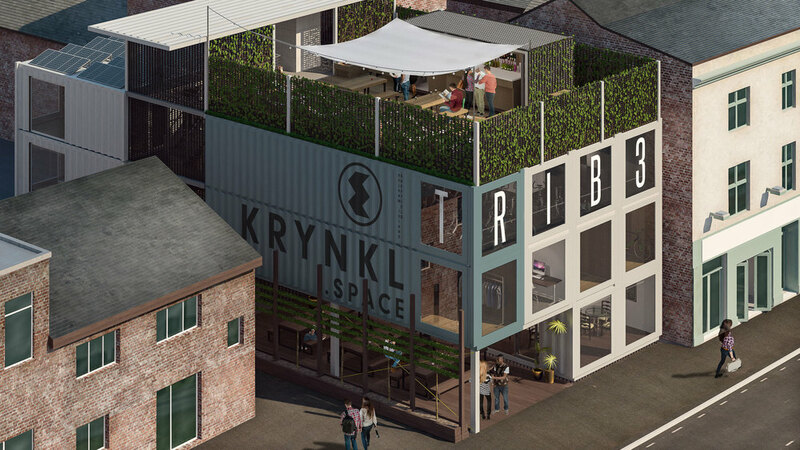 Find out more about KRYNKL, Sheffield here. To keep up to date with all our reviews, offers, competitions and more – sign up to our newsletter.